The island of Dominica will host its first Test match during India's tour of the West Indies in 2011, as the West Indies Cricket Board have chosen Windsor Park as the venue for the third and final Test of the series, to be held between July 6 and July 11. Windsor Park was built by the Chinese government as part of their memorandum of understanding with Dominica and Windsor Park has hosted four ODI matches - two against Bangladesh in 2009 and two against South Africa in 2010. India's tour of the West Indies in 2011 includes one Twenty20 international, two ODIs and three Tests. The venues for the first two Tests will be Sabina Park in Jamaica and the Kensington Oval in Barbados, respectively. 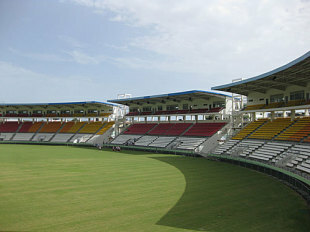 The Sir Vivian Richards Cricket Grounds in Antigua and the Queen's Park Oval in Port of Spain are the two venues for the ODI series. West Indies are scheduled to play back-to-back homes series against Pakistan and India between April and July 2011. Over the two series, eight different Caribbean cities will host games.